Cut bananas in half and insert a Popsicle stick into each half. Place bananas on baking sheet and freeze for 15 minutes. Meanwhile, melt the chocolate with coconut oil in a microwave safe dish (checking every 30 seconds) or in a bowl over a half full pot of simmering water. Stir until smooth. 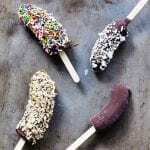 Dip each banana pop in the chocolate, then sprinkle with your choice of topping. Freeze Banana Pops for at least 30 minutes. Serve or store in an airtight container in the freezer for up to 2 weeks.